Here's a short story about my 24th birthday party dress. It was a few weeks before my birthday, I sent out invites but I didn't have an outfit to wear - naturally, as I had been swarmed with custom orders all summer. I wanted something glam but also comfortable, a dress I could dance in all night. My mum had sent me a bunch of fabrics but with this gold glittered Chantilly lace, it was love at first sight. So I thought, why not make a tea party dress? You know, something with a nice swirl, elegance and comfort. Win, win, win if you ask me. After a fun night surrounded by my loved ones, food, drinks and music, I ended up not taking high resolution pictures. I know what you are thinking, "pictures or it did not happen" but it happened I swear lol! 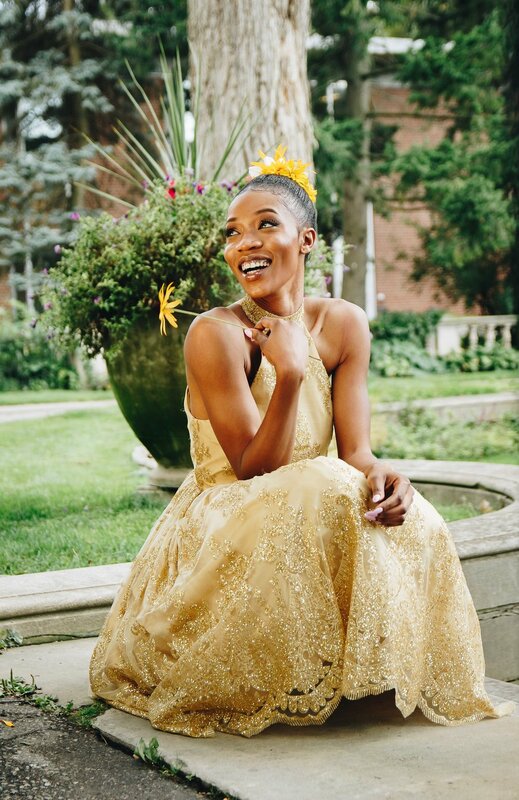 Anyways, my friend Stephanie who is also a model posed in the dress for a professional shoot and I think she looks gracious.